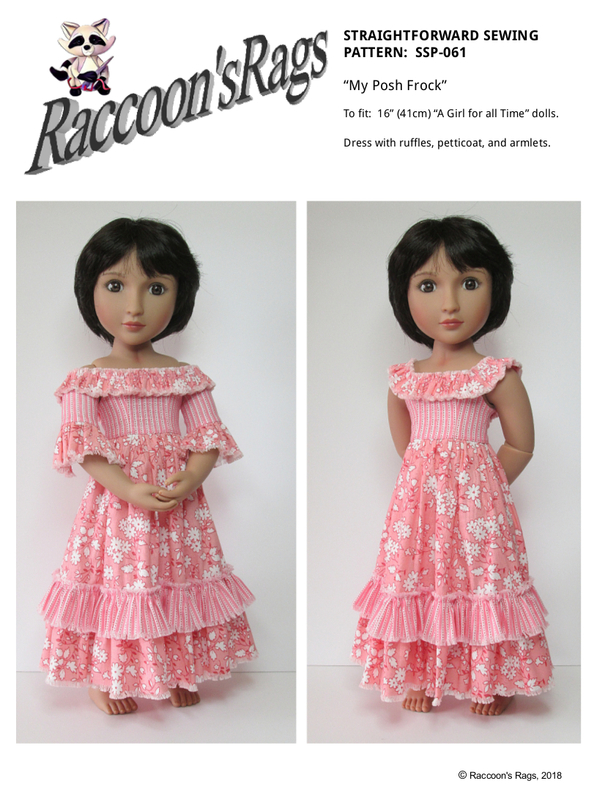 Raccoons Rags: SSP-061: "My Posh Frock" ~~~ A Girl For All Time. SSP-061: "My Posh Frock" ~~~ A Girl For All Time. At first I wasn't sure about buying one of these lovely ladies. I thought they'd be too huge to sew for, after having made the same mistake with a couple of 18" dolls. But they're lovely! the same height as my fave MSD size dolls, only wider in measurement, which wasn't too much of a leap. I was asked for "My Posh Frock" by a few different dolly folks, so here it is! The petticoat is important. Strapless garments on dolls can slip down the torso. The petticoat is designed to fit tightly around the doll's waist, and sits just under the dress bodice, supporting the dress in its correct position. So next, I'm making something else for these lovely dolls. I now actually have two, Nisha and Lydia. I'm quite smitten by them. They're like the 'big dolly' I always wished I had as a kid. People kept buying me baby dolls, and big dolls that I found - frankly - a bit repulsive. I always wanted a pretty doll, but back in the 70's the only cute ones were like Barbie, Sindy and Pippa. Not the larger ones. And as I never had a maternal bone in my body - unless my 'child' happens to be a puppy/kitten /tortoise/guinea pig - I frequently tortured the few baby dolls I owned. Yes, I could be quite an unpleasant child. Heh. These are the perfect balance of size and facial sculpt though. The sort that will sit on my bed, like teddy bears and such. Isn't it nice to enjoy one's second childhood?